QUALITY AND HONESTY SINCE 1981. Brad’s Roofing is a Family Owned Corporation. Incorporated in 1981, Licensed and Insured (#CCC058077); located in downtown Delray Beach, Florida. Owner/President Larry Bradford with 35 Years in the roofing business has a wealth of experience dealing with all the phases of roofing and roof repairs. Brad’s Roof Technicians are loyal experienced employees with over 55 Years in the roofing industry. Brad’s Roofing specializes in Residential Roof Repairs and Re-Roofs from Flat Decks to Pitched Roofs. Larry Bradford, President of Brad’s Roofing Company, Inc. started roofing in 1974 at Age 19. After 6 years in the field, He started Brad’s Roofing in 1980 and Incorporated in 1981. Larry is a State Licensed Roofing Contractor. His Motto is Quality 1st. Ft. Lauderdale in Broward County to Stuart in Palm Beach County. Brad’s is a FULL Service Roofing Contractor specializing in Re-Roofs - Tile, Shingle, Metal, Wood Shake, & Flat Deck Roofs. As well as ALL type of Repairs. Brad’s Roofing offers FREE Estimates. 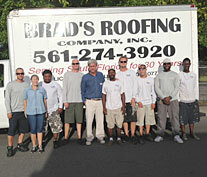 Brad's Roofing is a family owned and operated business in Delray Beach, Florida. Brad's Roofing has been servicing most of South Florida since 1981. Brad's Roofing strives to provide a high level of professional and clean service to all our clients.